Closed The site does not offer any results since December 2017 and is offline since 2018. Phil Bradley (2005): »Devilfinder  came to my attention a few months ago and I've been using it quite a lot. Options are limited to safe search, number of images displayed in one go and viewing results in a new window; no advanced search functionality there! Images are displayed full size, which leads to slow loading of pages, even on a fast broadband connection. 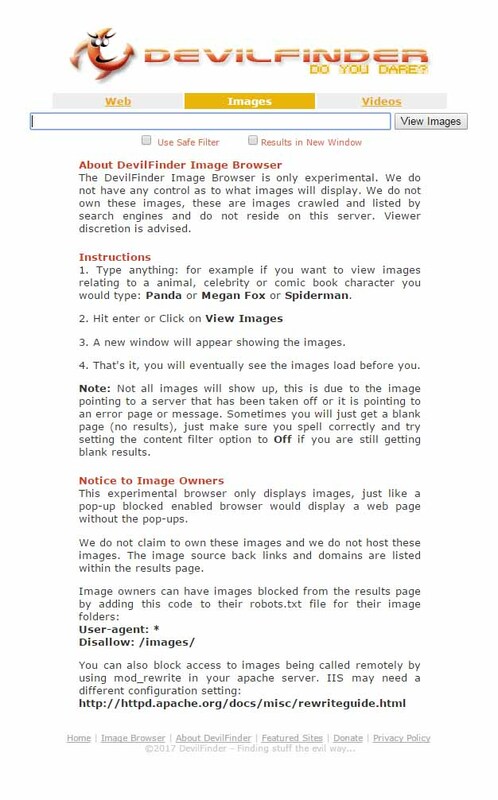 Devilfinder does provide an option to email the image to a friend, and to see a link to both the image link and the hosting site, which is not, I feel, particularly helpful. It does however offer a link to any videos of the subject of the search, which I did find helpful. All the results were on topic with my Lee search, although there were far more drawings than photographs. Unfortunately the engine doesn't tell you how many images it has found though. I was also slightly put off by the number of adverts on the page; they really clutter it up and reduce loading time even more. The Tony Blair search worked well and did give me an excellent set of results with which I was very happy. Similarly, the flowers search worked well, but initially I didn't think that I had any results at all, as I could see the advertising, but no images. The reason for this was that the first flower image was very large and was placed below the adverts. However, they were all absolutely relevant; all pictures of flowers. DevilFinder also performed well with the abstract 'internet' as well, it pulled up the by now familiar mix of graphs, diagrams and computer images.